Personalization is key when it comes to email marketing, as a new study reveals that personalized emails actually generate six times higher transaction rates and revenue per email than non-personalized messages. Experian Marketing Services’ 2013 Email Market Study analyzed the trends, stats and best practices of how marketers connected with consumers through email last year. The study found that personalized promotional messages have 29 percent higher unique open rates and 41 percent higher unique click rates than non-personalized messages. That uptick was similar for personalized triggered messages, which had 25 percent higher unique open rates and 51 percent higher unique click rates. Plus, the study found that personalized trigger campaigns resulted in more than double the transaction rates of non-personalized trigger campaigns. Another noteworthy stat from the study showed that 45 percent of marketers are leveraging pop-up windows on their websites to collect email addresses from subscribers, which is a 107 percent increase from 2012. That said, the majority (84 percent) of marketers still collect email addresses at the checkout page. The most interesting data from the study shed light on the adoption of new marketing tactics. For example, brands finally started to embrace mobile, as adoption of responsive design for email campaigns more than doubled in 2013 when compared to 2012. 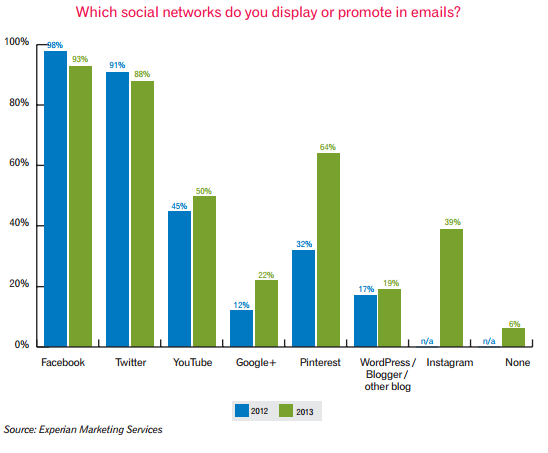 Additionally, more marketers promoted social networks within their emails, especially Pinterest and Instagram. For instance, only 32 percent of marketers promoted Pinterest within their 2012 campaigns, while 64 percent did so in 2013.